Good golly gosh, as if we collectors did not have enough to worry about with knock offs and replicas of vintage Generation 1 toys, now it seems that some industrious KO maker has started replicating Takara-Tomy Transformers Henkei and Hasbro Botcon exclusive toys. Word is that the exclusive Henkei Seeker pairing – Thundercracker and Skywarp – as well as the Million Publishing Generations 2009 exclusives Electro-Disruptor Mirage and Ghost Starscream and even the Botcon 2007 exclusive Stealth Mirage are among these new Classics and Henkei knock offs. 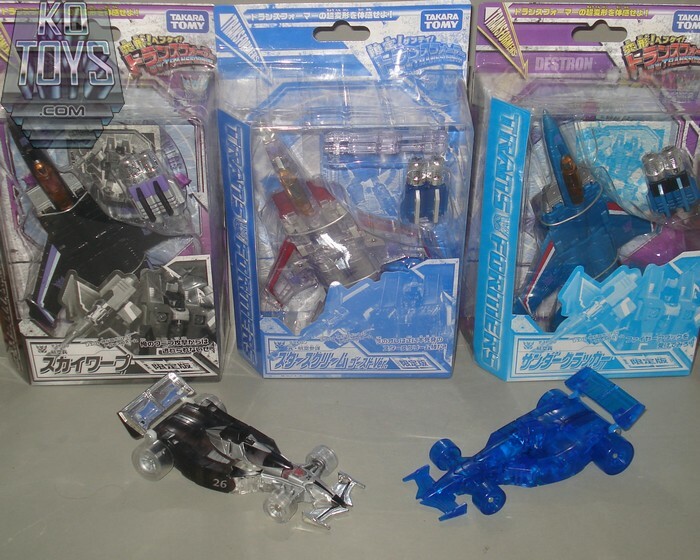 The Henkei knock offs even replicate the packaging of the originals, right down to the Takara-Tomy logos. Unfortunately there is currently no easy identification for the Henkei knock-offs. The Botcon 2007 Mirage knock-off is a little easier to figure out, as it lacks a rubsign and the clear plastic seems to be a different tone (though that might be down to the photographer). The word is these are currently retailing around the $30 mark, so if you see one of these toys at a suspiciously low price on Ebay, Taobao or another online source, you might want to exercise some caution. While those who’ve had them in hand claim the quality is comparable to the real thing, quality control varies greatly with knock-offs, not to mention that the pieces will not have been fully safety tested to the same degree as an official Transformers release. As always, “caveat emptor”.